This page Grotesque is part of the publication bias list of the Art and Popular Culture Encyclopedia, presented by Alfred Jarry. The word grotesque comes from the Latin root "grotto" which originated from Greek krypte "hidden place," meaning a small cave or hollow. The original meaning was restricted to an extravagant style of Ancient Roman decorative art rediscovered and then copied in Rome at the end of the 15th century. The "caves" were in fact rooms and corridors of the Domus Aurea, the unfinished palace complex started by Nero after the Great Fire of Rome in AD 64, which had become overgrown and buried, until they were broken into again, mostly from above. Spreading from Italian to the other European languages, the term was long used largely interchangeably with arabesque and moresque for types of decorative patterns using "non-existent forms [..] in which tendrils of the vine, acanthus foliage, parts of beasts and men and birds and fabulous creatures are brought into quasi-organic fusion with candelabra, goblets, lyres, and other familiar objects of utility" (Symonds, 1890). 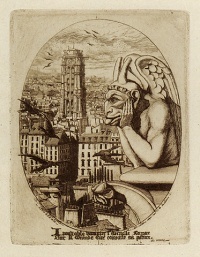 Since at least the 18th century (in French and German as well as English) grotesque has come to be used as a general adjective for the strange, fantastic, ugly, incongruous, unpleasant, disgusting, horrific and abject and thus is often used to describe weird shapes going as far back as the depictions of therianthropic Egyptian deities. In performance, and literature, grotesque also refers to things that simultaneously invoke in an audience a feeling of uncomfortable bizarreness as well as empathic pity. In the words of Philip Thomson in The Grotesque (1972, p. 27), a basic definition of the grotesque (in narratology) is "the unresolved clash of incompatibles in work and response. It is significant this clash is paralleled by the ambivalent nature of the abnormal as present in the grotesque." The grotesque forms on Gothic buildings, when not used as drain-spouts, should not be called gargoyles, but rather referred to simply as grotesques, or chimeras. As is the case with many sensibilities, it can be traced before the term itself is coined. The grotesque sensibility (as in horrific and abject) existed long before the term grotesque was coined, and can be traced to therianthropic cave paintings such as The Sorcerer and depictions of therianthropic Egyptian deities..
terracotta figurines are decorative artifacts. By the Hellenistic era, the figurines become grotesques: deformed beings with disproportionate heads, sagging breasts or prominent bellies, hunchbacks and bald men. Grotesques are a specialty of the city of Smyrna, even if produced everywhere in the Greek world, for instance, in Tarsus or Alexandria. Grotesque woman holding a vase. Another ancient writer who mentions grotesque painting but not the word grotesque was Pliny the Elder in his Natural History. He uses the word gryllus for a class of grotesque figures first used in painting by Antiphilus of Alexandria: "he painted a figure in a ridiculous costume, known jocosely as the Gryllus; and hence it is that pictures of this class are generally known as "Grylli." Bernard of Clairvaux in "Apologia ad Guillelmum" wrote on the "deformed beauty and yet a beautiful deformity" of monastic art. Explicit corbels featured grotesque figures. It is the age of Bosch (Christ Carrying the Cross) and Brueghel (The Fall of the Rebel Angels). When Nero's Domus Aurea was inadvertently rediscovered in the late fifteenth century, buried in fifteen hundred years of fill, so that the rooms had the aspect of underground grottoes, the Roman wall decorations in fresco and delicate stucco were a revelation. The style was soon copied. The first appearance of the word grottesche appears in a contract of 1502 for the Piccolomini Library attached to the duomo of Siena. They were introduced by Raphael Sanzio and his team of decorative painters, who developed grottesche into a complete system of ornament in the Loggias that are part of the series of Raphael's Rooms in the Vatican Palace, Rome. "The decorations astonished and charmed a generation of artists that was familiar with the grammar of the classical orders but had not guessed till then that in their private houses the Romans had often disregarded those rules and had adopted instead a more fanciful and informal style that was all lightness, elegance and grace." (Peter Ward-Jackson) In these grotesque decorations a tablet or candelabrum might provide a focus; frames were extended into scrolls that formed part of the surrounding designs as a kind of scaffold, as Peter Ward-Jackson noted. Light scrolling grotesques could be ordered by confining them within the framing of a pilaster to give them more structure. 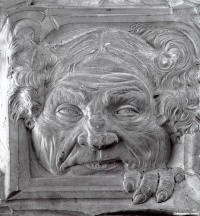 Giovanni da Udine took up the theme of grotesques in decorating the Villa Madama, the most influential of the new Roman villas. "this insatiable desire of man sometimes prefers to an ordinary building, with its pillars and doors, one falsely constructed in grotesque style, with pillars formed of children growing out of stalks of flowers, with architraves and cornices of branches of myrtle and doorways of reeds and other things, all seeming impossible and contrary to reason, yet it may be really great work if it is performed by a skillful artist." The decorations in Nero's Domus Aurea were introduced to Raphael Sanzio and his team of decorative painters, who developed grottesche into a complete system of ornament in the Loggias that are part of the series of Raphael's Rooms in the Vatican Palace, Rome. "The decorations astonished and charmed a generation of artists that was familiar with the grammar of the classical orders but had not guessed till then that in their private houses the Romans had often disregarded those rules and had adopted instead a more fanciful and informal style that was all lightness, elegance and grace." --Sheinberg, Esti, Irony, satire, parody and the grotesque in the music of Shostakovich. UK: Ashgate. pp. 378. In these grotesque decorations a tablet or candelabrum might provide a focus; frames were extended into scrolls that formed part of the surrounding designs as a kind of scaffold, as Peter Ward-Jackson noted. Light scrolling grotesques could be ordered by confining them within the framing of a pilaster to give them more structure. Giovanni da Udine took up the theme of grotesques in decorating the Villa Madama, the most influential of the new Roman villas. Through engravings the grotesque mode of surface ornament passed into the European artistic repertory of the sixteenth century, from Spain to Poland. 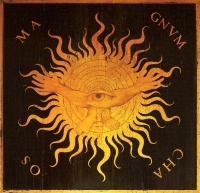 Soon grottesche appeared in marquetry (fine woodwork), in maiolica produced above all at Urbino from the late 1520s, then in book illustration and in other decorative uses. 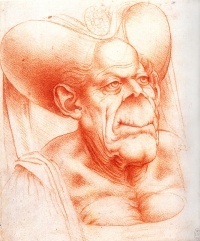 At Fontainebleau Rosso Fiorentino and his team enriched the vocabulary of grotesques by combining them with the decorative form of strapwork, the portrayal of leather straps in plaster or wood moldings, which forms an element in grotesques. By extension backwards in time, in modern terminology for medieval illuminated manuscripts, drolleries, half-human thumbnail vignettes drawn in the margins, are also called "grotesques". See the French ornemanistes and the Dutch auricular style. "Christoph Jamnitzer’s designs are, perhaps, a high-water-mark of a trend in Northern European mannerist grotesquerie that had begun in Antwerp in the 1550s, with the stylised designs of Cornelis Floris, and which had been continued by such artists and craftsmen as Joris Hoefnagel, in the illuminated alphabet appended to the Mira Calligraphiæ Monumenta, and by the brothers de Bry, in their Neiw Kunstliches Alphabet of 1595." --Giornale Nuovo"
In Michelangelo's Medici Chapel Giovanni da Udine composed during 1532-33 "most beautiful sprays of foliage, rosettes and other ornaments in stucco and gold" in the coffers and "sprays of foliage, birds, masks and figures" (Lives), with a result that did not please Pope Clement VII Medici, however, nor Giorgio Vasari, who whitewashed the grottesche decor in 1556. 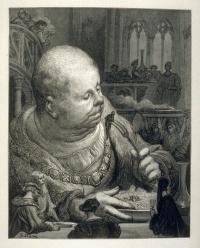 Counter Reformation writers on the arts, notably Cardinal Gabriele Paleotti, bishop of Bologna, turned upon grottesche with a righteous vengeance. The grotesque masks, Pourtraicture ingenieuse de plusieurs façon de Masques by Cornelis Floris, engraved by Frans Huys, are an excellent example the mannerist grotesque. Grotesque ornament received a further impetus from new discoveries of original Roman frescoes and stucchi at Pompeii and the other buried sites round Mount Vesuvius from the middle of the century. It continued in use, becoming increasingly heavy, in the Empire Style and then in the Victorian period, when designs often became as densely packed as in 16th-century engravings, and the elegance and fancy of the style tended to be lost. Grotesque (generally with an upper-case G) is the style of the sans serif types of the 19th century. Capital-only faces of this style were available from 1816. The name "Grotesque" was coined by William Thorowgood, the first to produce a sans-serif type with lower case, in 1832.
what are these things I scribble, other than grotesques and monstrous bodies, made of various parts, without any certain figure, or any other than accidental order, coherence, or proportion? Montaigne goes on to quote Horace: "Desinit in piscem mulier formosa superne." One of the first texts to use the term as an insult was Sir Walter Scott in the "On the Supernatural in Fictitious Composition" (1827), his extended analysis of the work of E. T. A. Hoffmann. Literary works of mixed genre are occasionally termed grotesque, as are "low" or non-literary genres such as pantomime and farce. Gothic writings often have grotesque components in terms of character, style and location. In other cases, the environment described may be grotesque - whether urban (Charles Dickens), or the literature of the American south which has sometimes been termed "Southern Gothic." Sometimes the grotesque in literature has been explored in terms of social and cultural formations such as the carnival(-esque) in François Rabelais and Mikhail Bakhtin. 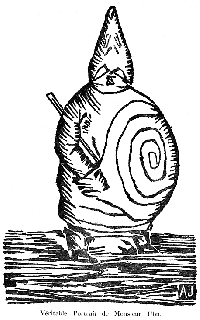 The grotesque is often linked with satire and tragicomedy. It is an effective artistic means to convey grief and pain to the audience, and for this has been labeled by Thomas Mann as the "genuine antibourgeois style". The grotesque received a new shape with Alice in Wonderland by Lewis Carroll, when a girl meets fantastic grotesque figures in her fantasy world. Carroll manages to make the figures seem less frightful and fit for children's literature, but still utterly strange. In Germany, authors such as Salomo Friedlaender and Paul Scheerbart began to label their short stories as grotesken (grotesques). Flemish poet Paul van Ostaijen was influenced by these two writers and similarly wrote 'grotesques'. The tradition was continued by Flemish writers Gust Gils and Gaston Burssens, both writers of short stories they labeled grotesques. Other writers in the genre include Ferdinand Bordewijk, Til Brugman and Fritzi Harmsen van Beek. A writer that needs to be mentioned in this category is Franz Kafka. It should not come as a surprise that van Ostaijen had been Kafka's first foreign translator, publishing in Dutch five of Kafka's short prose pieces from Betrachtung in 1925. An anthology of German Grotesken by Karl Otten was published in 1962 under the title Expressionismus - grotesk. Contemporary writers of grotesque fiction include Will Self and Chuck Palahniuk, and many authors who write in the bizarro genre of fiction. One example is Ludwigs Erbe by Peter Lenk. A number of art and literary historians have written on the grotesque sensibility, the first exploration of the grotesque was by English art historian John Ruskin in the 19th century, in The Stones of Venice and Modern Painters. But even before Ruskin, an anthology of Leonardo's grotesques was published in France under the title Recueil de testes de caractere et de charges dessinees par Leonard de Vinci florentin (1730). In the 20th century there was The Grotesque in Art and Literature (1957) by German historian Wolfgang Kayser and Russian Mikhail Bakhtin, who developed the notion of "grotesque body" in relation to the work of French Renaissance writer François Rabelais. 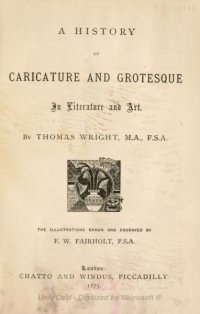 The first post-war study on the grotesque was by Philip Thomson (The Grotesque, 1972). Notes on the grotesque sensibility have been written by Joyce Carol Oates in the introduction to Haunted: Tales of the Grotesque and the contemporary grotesque in the visual arts has been explored by Robert Storr in Disparites & Deformations: Our Grotesque. Late 20th and early 21st century research, primarily published on the internet, was done by such enthusiasts as Ian Mccormick, whose Encyclopedia of the Marvelous, the Monstrous, and the Grotesque is indispensable and by David Lavery in his grotesque checklist. Unless indicated otherwise, the text in this article is either based on Wikipedia article "Grotesque" or another language Wikipedia page thereof used under the terms of the GNU Free Documentation License; or on original research by Jahsonic and friends. See Art and Popular Culture's copyright notice. This page was last modified 19:41, 7 January 2019. This page has been accessed 61,754 times.